Designed as one of the higher end Parker 45's the Coronet has an aluminum body anodized to create a coloured finish on the surface of the pen. Being aluminum the Coronet is noticeably lighter then the steel Flighters from the same time period, weighing in at around 13.5g empty (without cartridge or converter) compared to the Flighter's which weighs in at around 17.0g empty. Manufactured at the Parker factory in the USA it would appear that the earliest pens date back to 1967 and remained available until the mid 70's. Being less common then the standard steel Flighters they tend to command much higher prices for good examples and it it common to see ordinary or customised Flighters being described as Coronets. 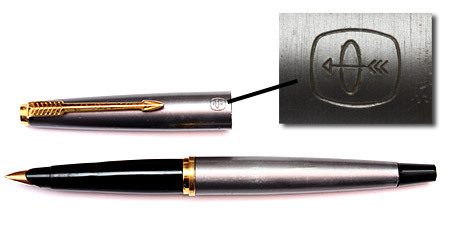 Luckily the Coronet has a unique marking - the Parker Arrow and Halo symbol which on the Coronet is enclosed within a rounded rectangular box and is engraved on the cap in line with the pen clip. 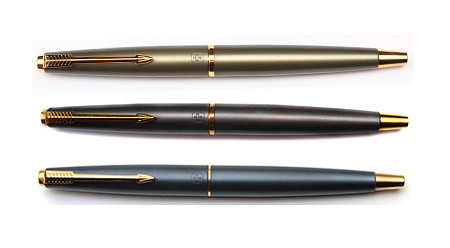 This appears to be unique to the Coronet amongst the Parker 45 family of pens. Often the gold clutch ring between the cap and the barrel is also wider then the standard Flighter model.